In hiking Madonna Mountain stunning vistas present themselves one after another. 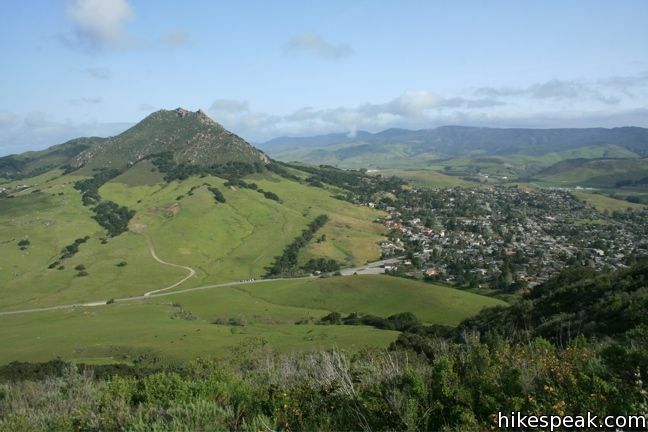 At its peak, take in the sweeping landscape of San Luis Obispo in every direction. The trail is well taken care of, accessible year-round, and not too difficult. It is a little less than two miles round trip and takes, at a moderate pace, a little over an hour. Madonna Mountain is part of the Seven Sister extinct volcanoes chain. It is accessible from Marsh Street exit from Highway 101 in San Luis Obispo. Talk about a view! The best way take this really unforgettable ride is to go tandem. Your plane will take you up to 13,000 feet! It only requires a minimum of training as your partner is a skilled professional that will be safety tethered to you from bailout to landing. 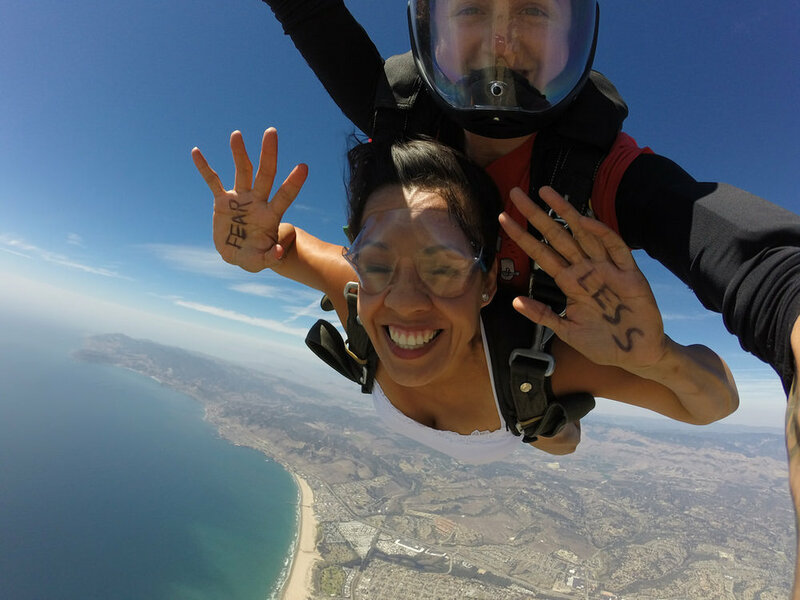 From over two miles above the earth, relish truly unique perspectives, from a blazing 120 mph drop and its eagle eye observations, to the rolling hills and horse ranches coming into view on your gradual and contemplative descent. Lopez Lake, just east of the quaint village of Arroyo Grande, offers a wide variety of beautiful lake scenes. The best way to enjoy them is to rent a boat, motor out to a tranquil spot, and set-up camp. Take the picnic basket out, unpack a lunch and ice cold beer or Champagne, and just settle into quiet afternoon of watching the water and undulating landscape, soaking in the midday sun, and the doing nothing but unwinding. And on the way back, consider a stop at Talley Vineyard. The winery has outstanding wines and a beautiful tasting room with views overlooking the vineyards and farmlands of south San Luis Obispo County. The Cal Poly Design Village provide a lot of very diverse and cool perspectives. The trail starts from the northeast corner of the Cal Poly Campus in San Luis Obispo. As you hike, you’ll walk by stately Coast Live Oaks, along a creek, and up through the rolling hills, all with brilliant views of the surrounding peaks. A ways up, there is a picnic area for a moment’s sojourn. Just pass that, there is a stone arch. Take it and you’ll find yourself at the Cal Poly Design Village with a hodgepodge of experimental architectural structures. It is a bit offbeat, yet quite interesting. It is a little over two miles out and back and takes about an hour plus for the hike itself, but with a picnic and to check-out the Design Village it will obviously be a bit longer. And if you’re in the mood for a longer hike, travel up the trail, past the Stone Arch, to the well-known Serenity Swing—which some people say has the best view in SLO. The restaurants at SeaVenture Beach Hotel and the Cliffs Resort in Pismo Beach feature some of the best views in San Luis Obispo County. The SeaVenture, situated right on the beach, offers diners panoramic of the ocean and miles of unspoiled beaches. And the Cliffs—aptly named—with its elevated lookout, presents stunning vantage points of the wide expanse of the Pacific—north and south. At both restaurants you’ll see surfers and sailboats—and, if you’re lucky, whales and dolphins, and, of course, splendid sunsets. And not least, both restaurants have outstanding food and lively and friendly bars! Newer PostTop 5 Ways to Get Active While Exploring the Bounty of SLO County!